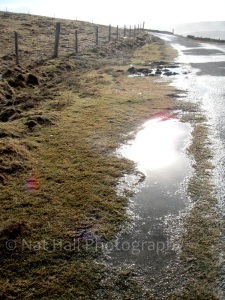 ditches, roadsides. That snow remains a memory. 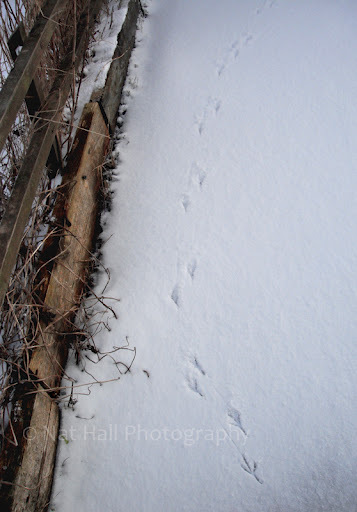 And from the roof of my marshy world, I felt water beyond the edge of hiking boots, as I walked around my hillside. In search of the first song of the skylark, I found some early visitors at its bottom: orange-billed, pied, beak inside earth, foraging hard in search of grubs hiding in mud… Yes, our dear shalders (oystercatchers) can dine in style! Saturday bathed in this springlike air and I could not resist making the most of such moment. 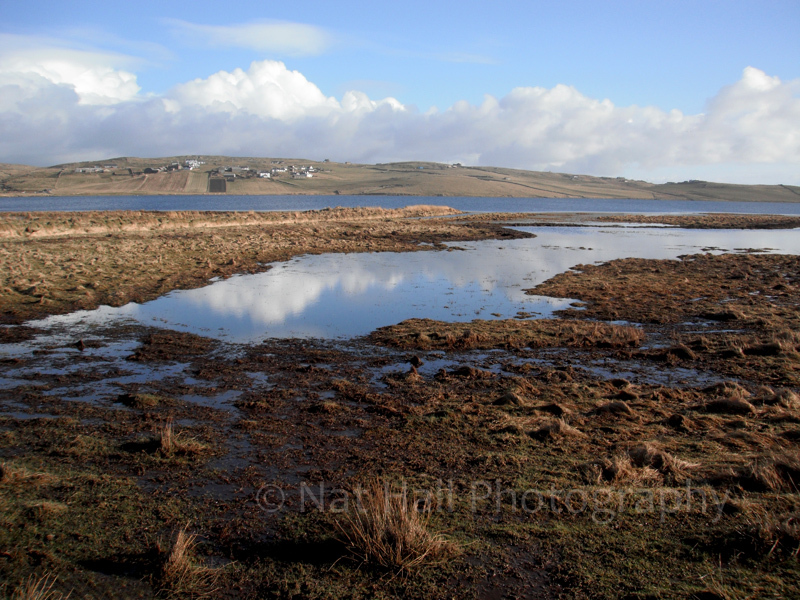 The Lush fields around Spiggie (though waterlogged too) act as magnets for geese and farmland birds. And geese graze about everywhere! In a game of “catch me if you can”, ravens stayed high when they were not hopping around mangers among sheep. Common gulls made me grin from one to the other end of field edges. Shelducks , Red-breasted mergansers and Tufted ducks (now in their pairs) kept well at bay… Redshanks & Ringed plovers patrolled the loch’s edge. Whooper swans fed in their usual position (tail up) and large rafts of gulls and maalies … I later saw a Slavonian Grebe at the southern end of the loch. My Saturday sky filled with feathers against blue. I love the island in such light. raw, majestic, it shines through the eyes of deep space. The sky speaks many tongues in a myriad of voices. It learnt to whisper and to shout… it cries and smiles without reasons. Today it unveiled the colours of late February. 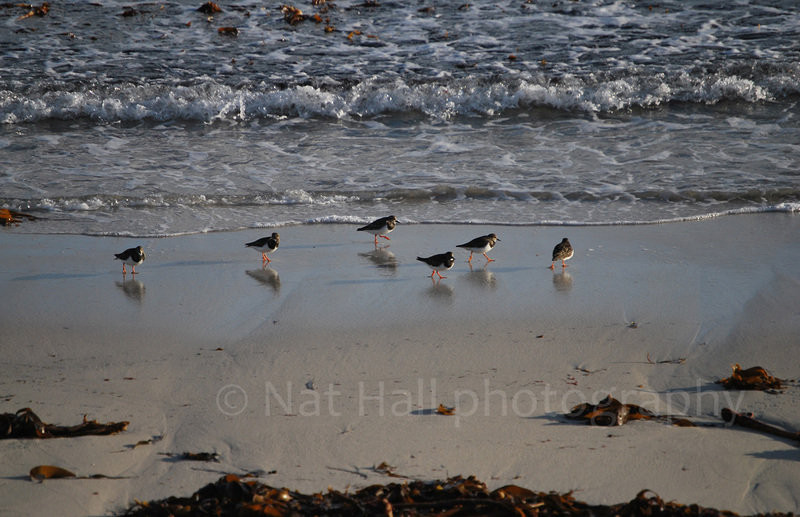 And when you wonder to the shore, birds walk the length of ocean’s edge. And when we begged goodbye to the day, dusk settled its trillions of treasures. I love our sky at those moments. Blue, orange, indigo, crepuscular, and still so calm. 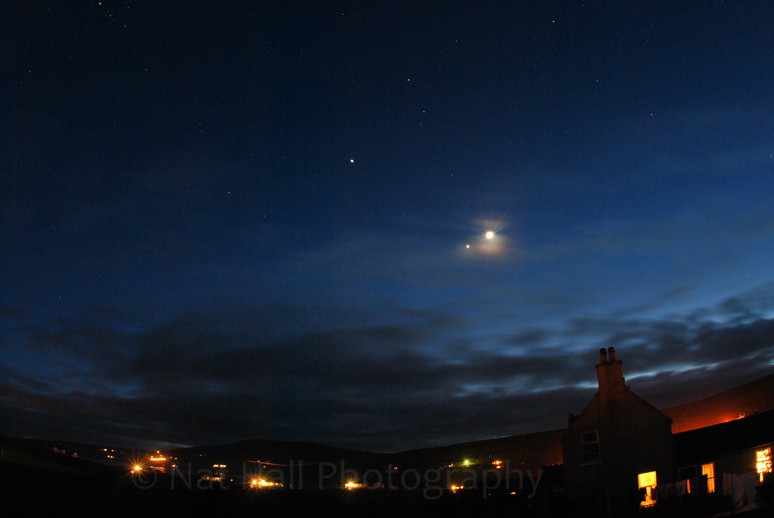 And Venus shone left to the Moon. I love the sounds of earthly moments that take you away from the consistent bombardment of a “noisy” world in its many forms. 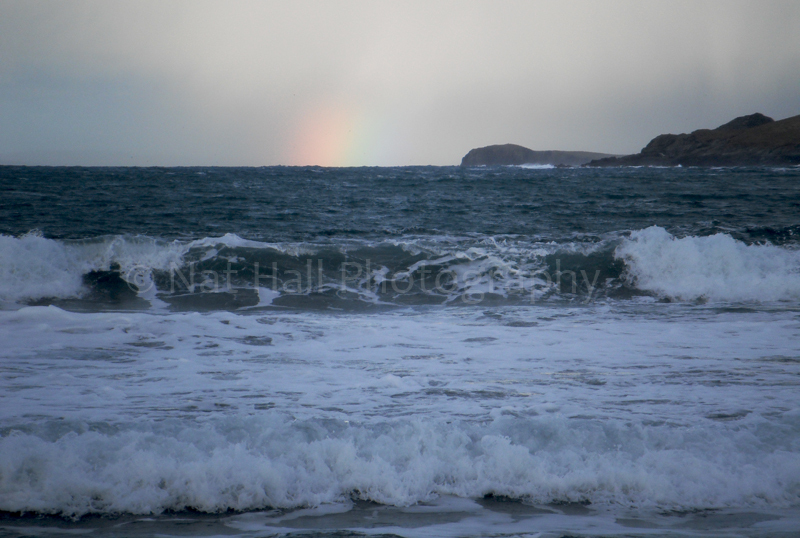 Tonight, the wind has dropped and I imagine rainfall between The Minch and the island. And then, music comes through the hut. Piano and voice. Kate Bush’s music plays late tonight too. I was in the middle of “Misty” when I interrupted that wonderful song for a rare interview with Kate. And what an interview! Please click here for a moment of joy, punctuated with Kate’s giggles and humanity. Some great insight into her world. February remains an extraordinary month. It is a time when life returns, even if only through whispers. For every journey through the land, familiar sounds add to the light. If gales still prevail through most mornings, precocious signs of renewal become more flagrant after dawn. One hears excitement through the bare trees of my garden. 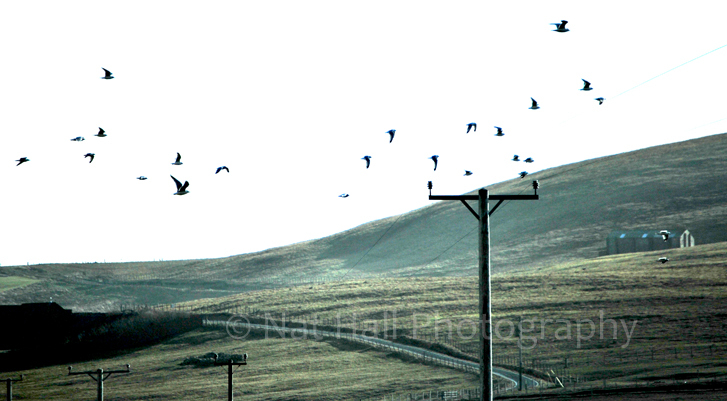 Blackbirds, sparrows, gulls, corvids of northern kinds… Geese in gaggles or above heads. All so more noticeable now. It is a hymn to early spring. 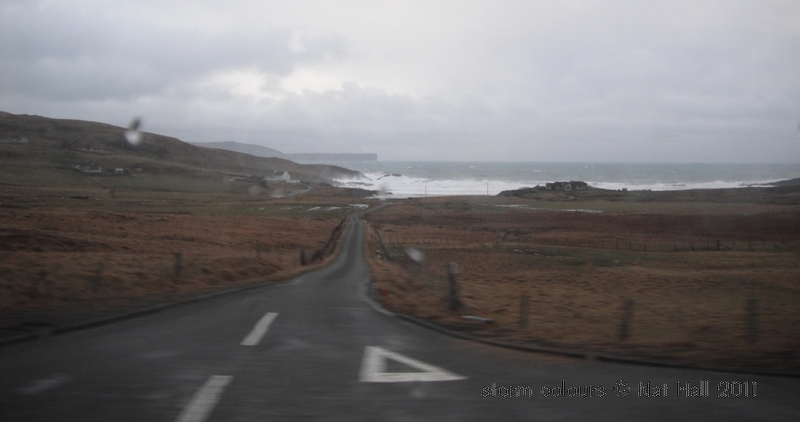 That main trunk of tarmac that links the island from north to south. My daily run to the town means a good opportunity to watch one of my favourite birds: ravens. February draped by their early aerial display, those majestic jet black flyers defy laws of acrobatics. Now they come to perch by the roadside for breakfast. Tarmac offers free restaurants for them and all our local gulls that come to feast on carrion. Some unusual and strange way to survive… Yet their success for survival depend on our rate of road kills, mostly rabbits that plague the land. They’ve learnt patience and great timing on the approach of vehicles, and will get aloft as headlights become too near to their feathers. As morbid as it may sound, those muckrakers have turned such formidable opportunists, and their dare-devil flying skills have made them one of the most successful species in our world. Fascinating species that inspires tales of all kinds. From folklore to music, their jet black wings do not cease to amaze and awake musings of all sorts. According to culture, they turn devil or gods… In Native American realms, they bring change and allow you to travel between worlds. In Scandinavian history, Vikings came to our land to collect young ravens as means of GPS – by launching them at sea to find land ahead – on their travels westwards/north-westwards. They are present in so many folk tales, songs and omens! And There, the tale of The Three Ravens, Germanic style. 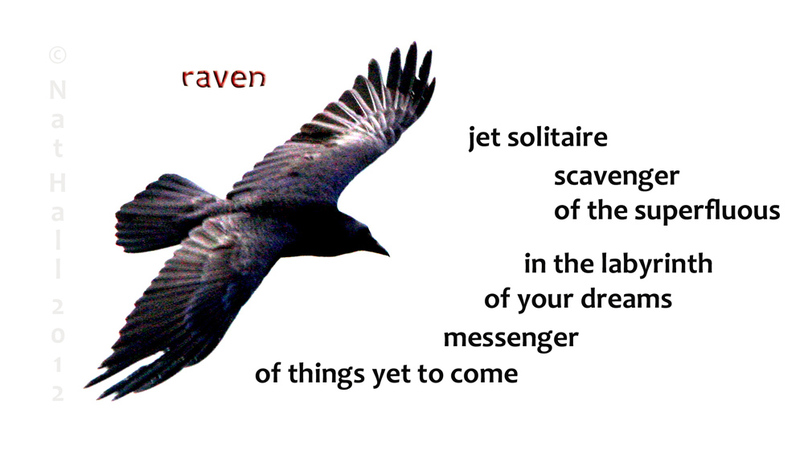 To my humble heart, ravens remain fantastic birds that symbolise freedom in flight. Every morning begins with them. We have been warned. That exotic (anything above zero Celsius) air would not last long… Kate’s 50 words for Snow is playing inside the hut, as am I’m savouring a bowl of warm porridge. 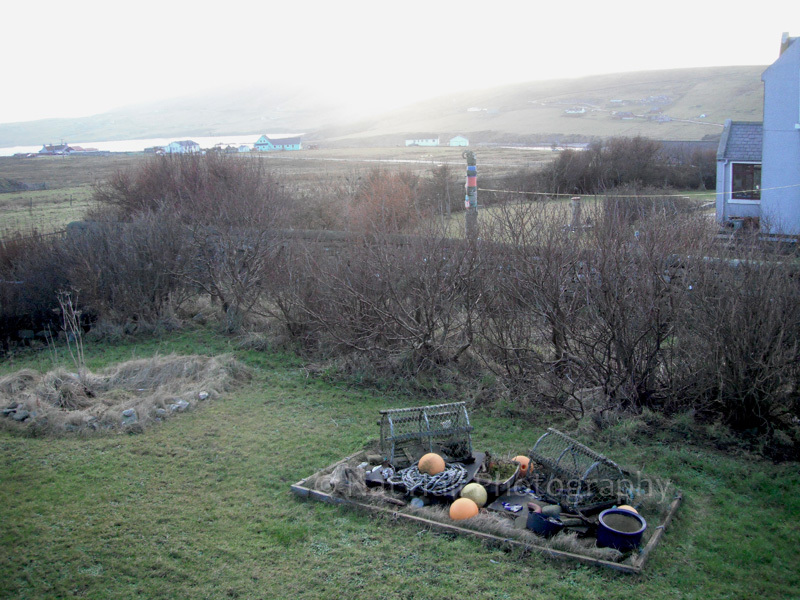 The island once more caught in some Arctic spell, with a thin, though icy sheet of snow, has clad every meadow, garden and geo. Our three felines ventured fully clawed on the icy blue. 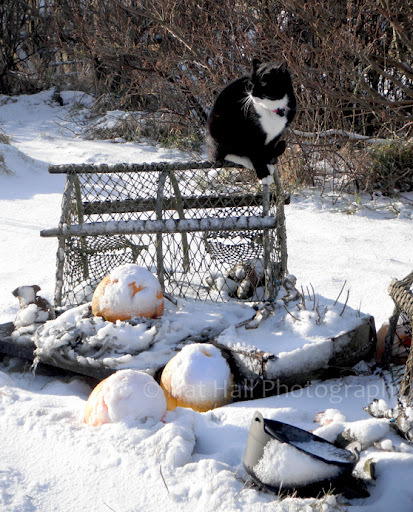 Peewit the Cat clambered over the crab basket and watched geese in mid-morning sky from his post. He looked a sphinx in this ocean of ice. Frozen garden in glorious light on Sunday morning. Overnight gales let us enjoy more magic from our Nordic sky, with yet another luminous display of aurora. Mirrie Dancers delighted eyes late in darkness. So cold though through this Arctic air. If at the start of February, I felt on the shore of the Labrador, today makes me think of Svalbard, or somewhere near the horizon of South Georgia, South Shetland or Orkney Islands, or even Iles Kerguélen… A short walk around my patch transports my heart to those desolate freezing realms. Scott, Charcot and Shackleton belong to this catalogue of famous polar explorers, and yet, other names, no so well remembered, adorn this list. 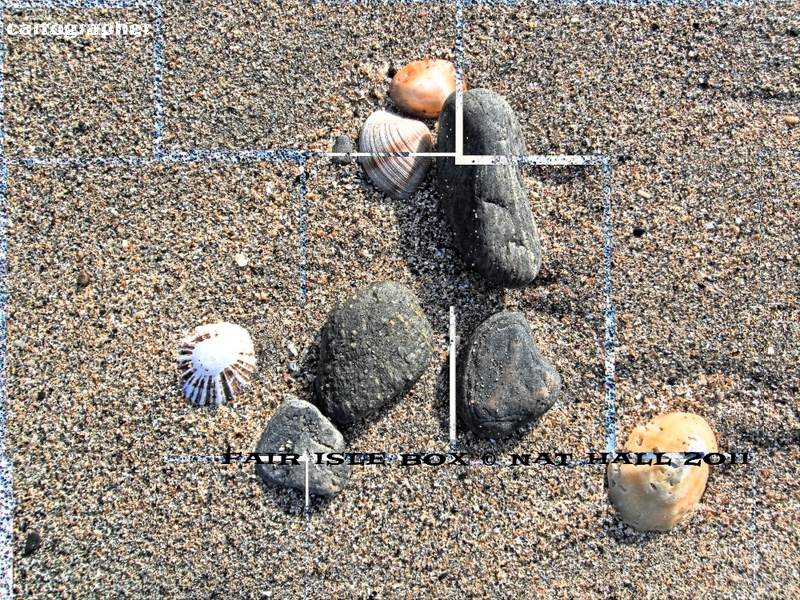 No leopard or elephant seal, just common and grey ones can be found all around my shore. Each print of snow boot has its rewards. I heard a snippick (snipe) in the nearby field, and geese calling above my head. So was the theme of my stravaig before lunchtime. Everything belongs to the ice. 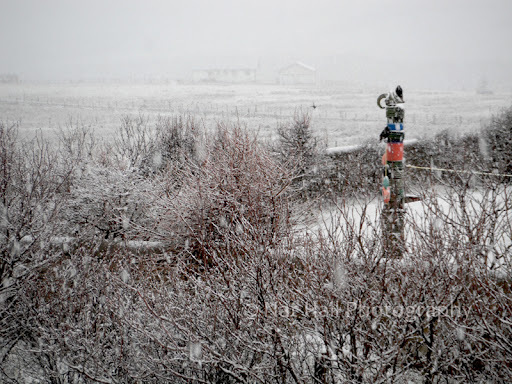 In defiance to eyes and claws of February, sparrows and starlings sang during snowfall on Saturday. So eager to chase this spell of desolation, they stood and chirped all around us. Every tree began to feel the weight of winter. Sticky snow whitened our world. 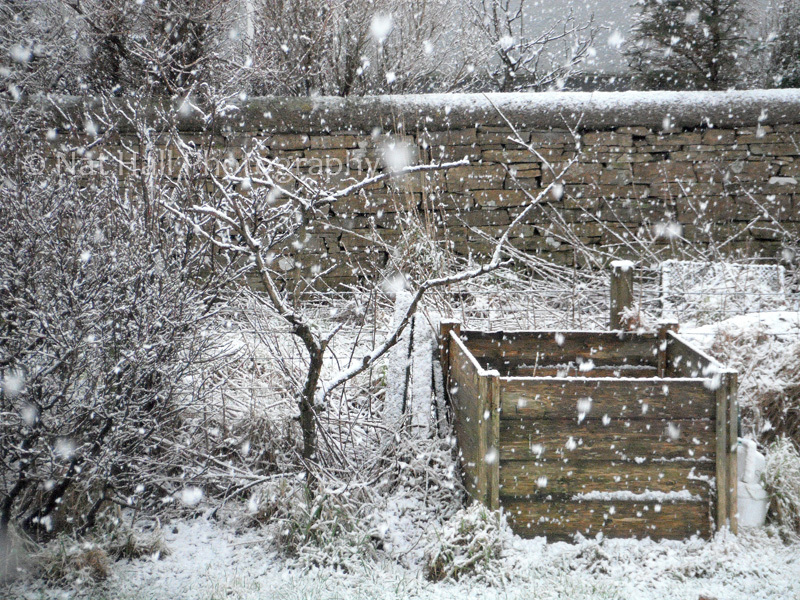 But still, birdsong filled in sound this myriad of snowflakes. My Nordic world sounded so light. 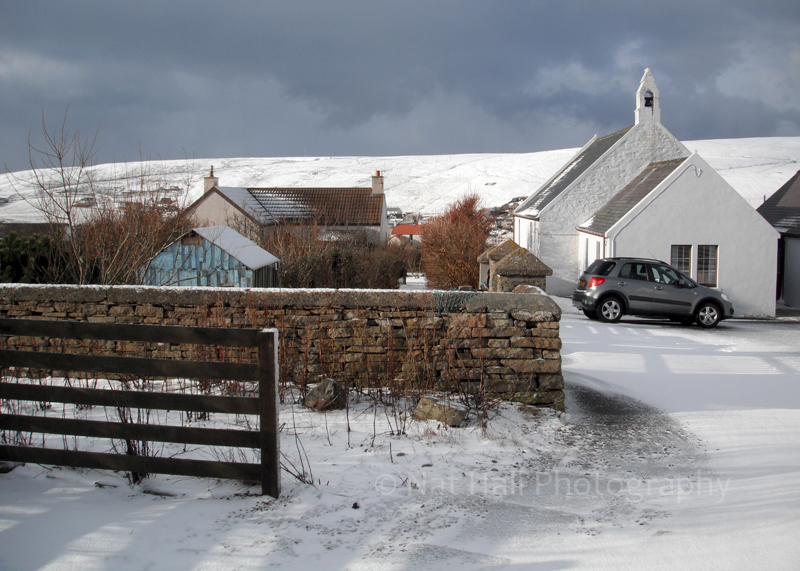 June & Richard’s Old Manse looks so romantic clad in white. The old stone walls harbour comfort and secret worlds fit for a starling, gull or wren. They too feed birds that come to shelter from harshness. Among bits of twisted branches and frozen garden, tubes of peanuts hang from bareness. Birds know it so well. later they will find a suitable tree to love and fare for their offspring… In the meantime, they have to make do with whiteworld. deux étourneaux attendent la neige. 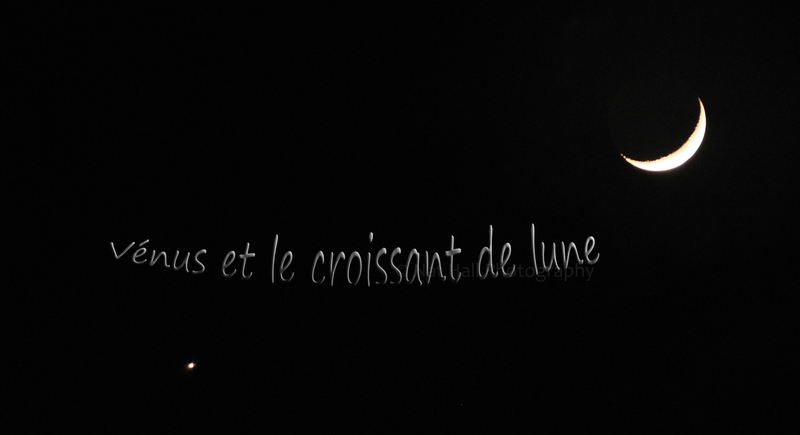 Tonight I heard the blackbird’s Braille and caught our Moon in eastern sky. 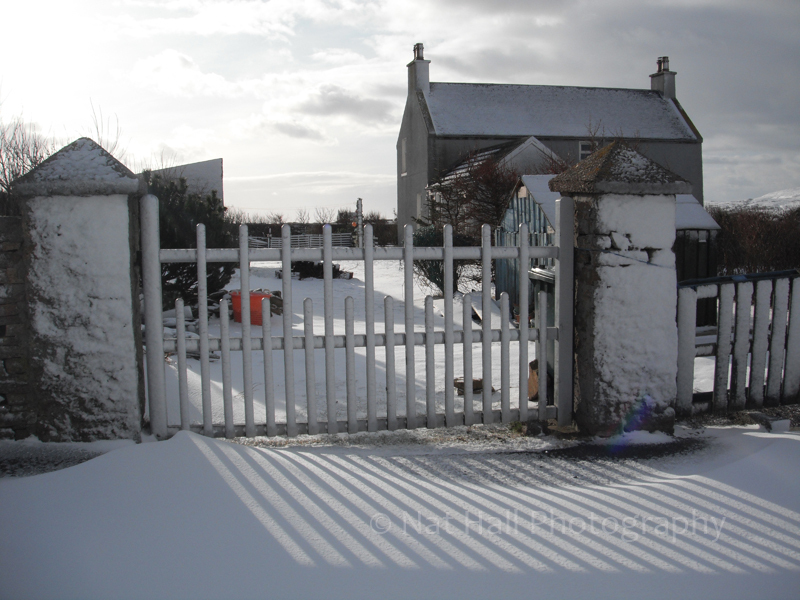 We, islanders, have endured gales instead of snow. Morning downpours led way to light. 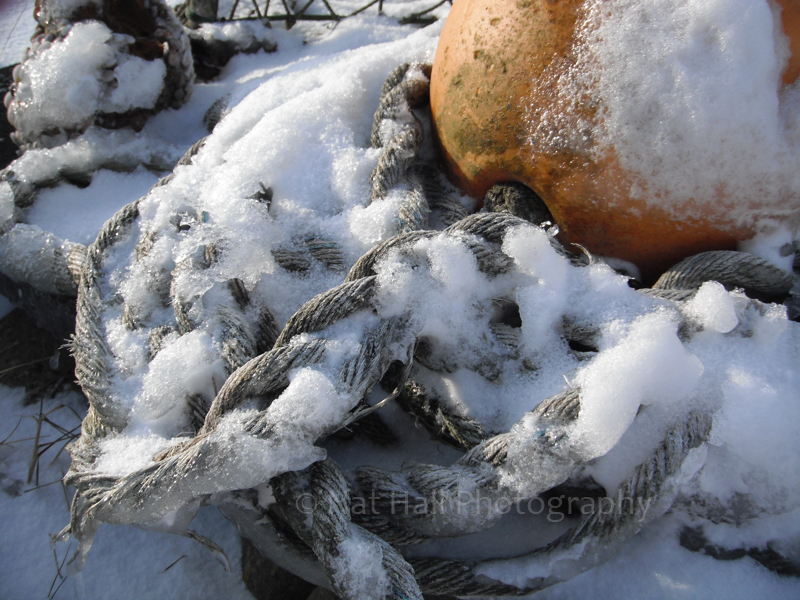 The air was as freezing as our wild North Atlantic. The Westerlies feel so bitter, as sun ventures across our sky. February, the coldest, harshest month with a desire to make you feel its sharpest claws… Raw, incisive, as wolf fangs through the flesh of a buffalo, and yet as invisible as a dream, snowless winter grips you and turns you blue. I could have felt on some shoreline in Hudson Bay; along the coast of Labrador… Those cold deserts, tundra landscapes, where permafrost still dreams of warmth and waders’ calls, feel just like home. Each tongue of land holds its secrets. Mine stands so proud in-between North Sea and Atlantic. Battered and constantly windswept, the island withstands anger from currents, rotating blades of each roller, ending their race on sculpted sand or against rocks, stacks and natural arches. Earthly Rodin. They shape our shores like a sculptor… They carve through basalt and Old Red Sandstone without shame and carry the world in their bellies. Every pebble locks its nomad’s tale. 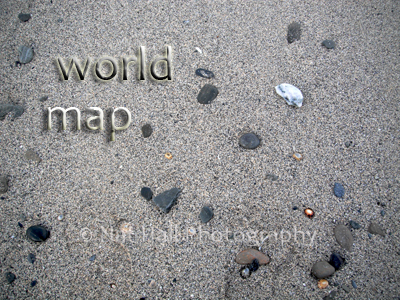 And yet I grab those precious stones, as I retrace my steps back home. Birds unfolds wings to brave currents and reach heavens. Sweet freedom, flowing in my heart. By sunset time, I watched gardens fill with our most common visitors. Since we planted trees in not such a distant past, they have now grown to perching springs, well above ground and feline eyes. As soon as I opened the door onto the sliding sun, the sky unveiled earth symphony, as starlings, sparrows and blackbirds hovered around barren branches. So many voices filled our sky. gathering on top branches from June’s secluded garden and fly off for roosting time. Life, a constant flight for survival. Another night, morrow or year. I wonder if they too stick to almanacs. It has gained in stature. It is now known around the world. It leaps from island to island… It fills our sky with sparks and light and parrafin lingers in our hearts forever. Each last Tuesday of January, fire fever sparks off all around town. 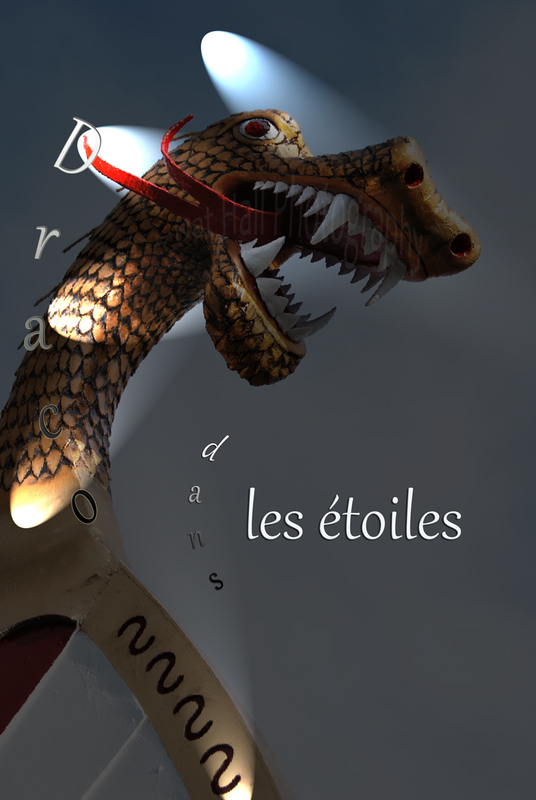 The dragon’s back around our walls, and with it, hordes of boys and men in starting blocks for merriment. In my night sky, Draco awaits curtain of night to show the way. On this last day of January, young islanders turn warriors and invest corridors inside their own institution. Everyone gathers to applaud and marvel at shiny helmets. 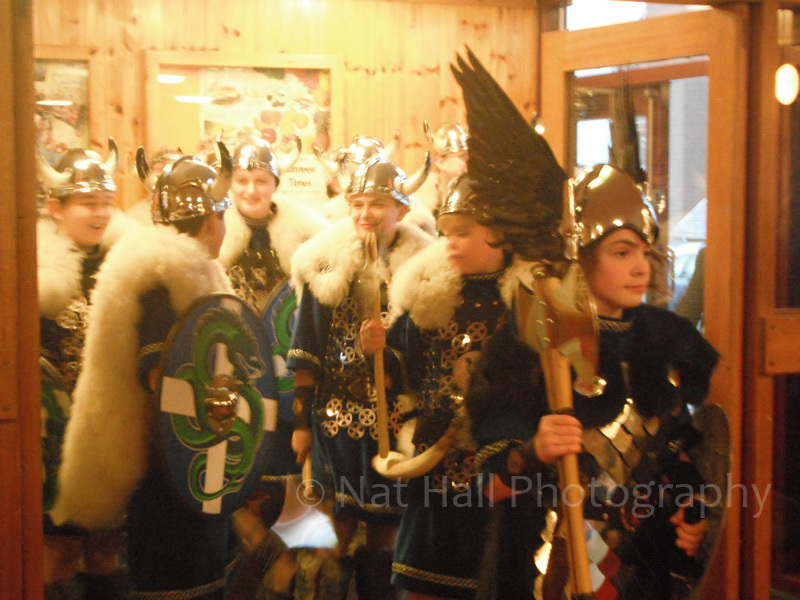 The atmosphere is bon enfant, as staff and pupils play the game until our squad of young Vikings join their elders by the harbour. It is indeed a special day for those young men who represent our school. They too have their own galley to set on fire and walk in footsteps of elders. Fire fever animates hearts throughout the day. It kicks early and will demand another day to recover from party time! It culminates with the now famous procession. In the meantime, boys and men have to endure a much accepted marathon by visiting schools, hospital, care homes and whoever wants to see them before sunset. The procession well after dusk shines as highlight. Folk from the world come to marvel at boys & men ready to march and turn their boat into ashes. Impressive prints left in your eyes. As night progresses, the guizing men will engulf halls where women wait to serve and feed with tattie soup (or reestit mutton) and other liquid concoctions until next dawn… For those of you familiar with the opening scene from the movie Beowulf – mind you, minus Grendel and treasures! – the allegory won’t feel too strong. 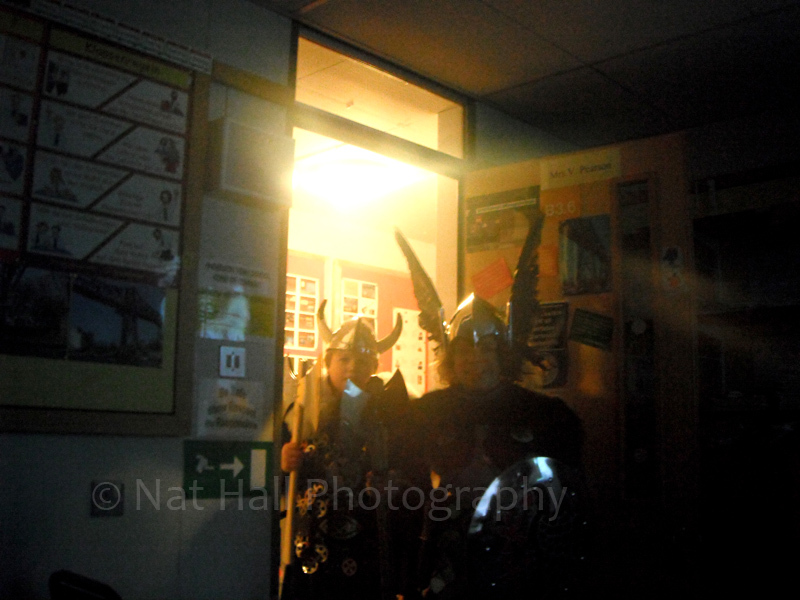 In our depth of winter, Up-Helly Aa feels so welcome as light begins to override night in a much more assertive way. 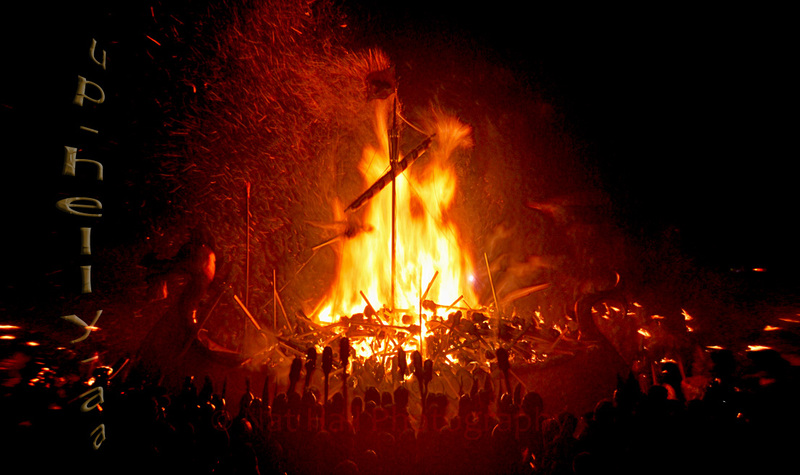 This year, Imbolc follows so close to Lerwick’s Up-Helly-Aa. 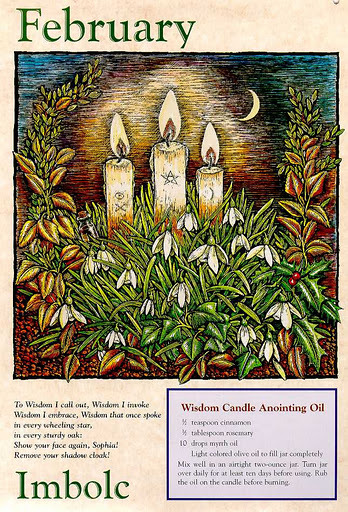 Imbolc, the Earth’s true beginning of Spring, and with it, the very first and timid steps to renewal. Our dawns have become precocious – our afternoons linger longer… Sometimes sunsets turn pink and blue in pastel style and this precious nordic light carve smiles in eyes and hearts. 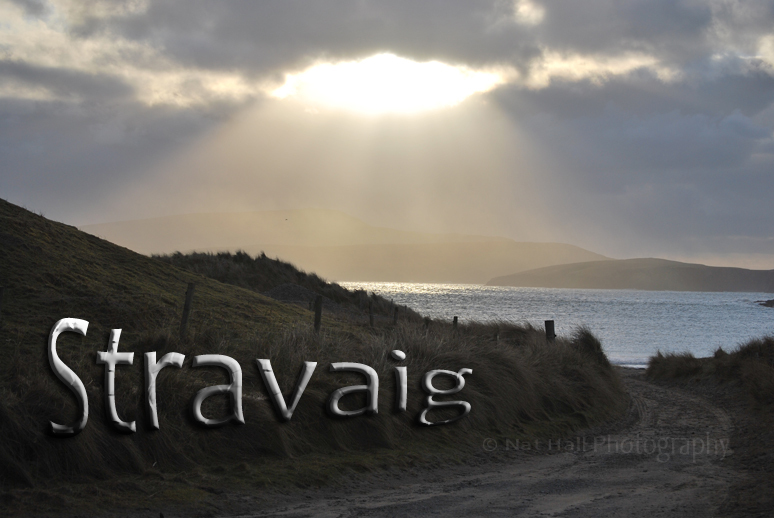 It gives us time to wander (“stravaig”) around our shore. Long-tailed ducks mingle with Eiders & Goldeneyes, common Scoters, kittiwakes and selkies… Little auks have been seen. 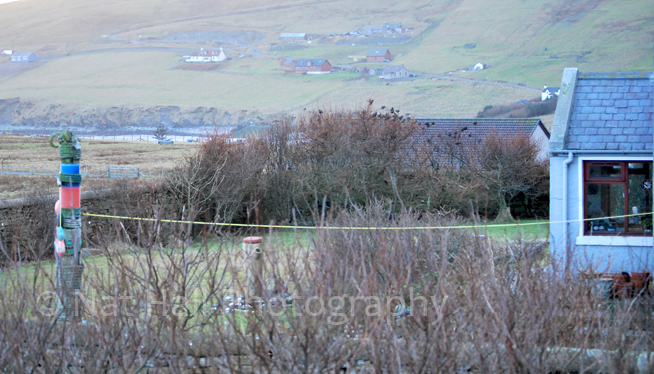 Ravens re-started their acrobatics, as courtship begins on roadsides at breakfast time. Ravens, once captured by Vikings around the island to be used as scouts & seekers of land beyond seafarers’ horizon… Starlings and sparrows filled this morning’s sky with calls and chirps, so quarrelsome can they become. Even if the land feels desolate, precocious signals are noticed. Our path to the Vernal Equinox looks now lit. 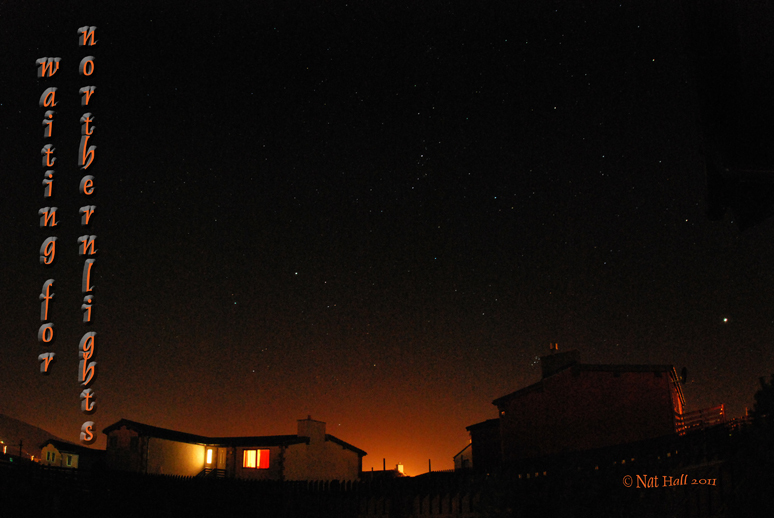 And until then, we shall keep our beacons alight, watch out for ice at every dawn and salute Draco in our sky. 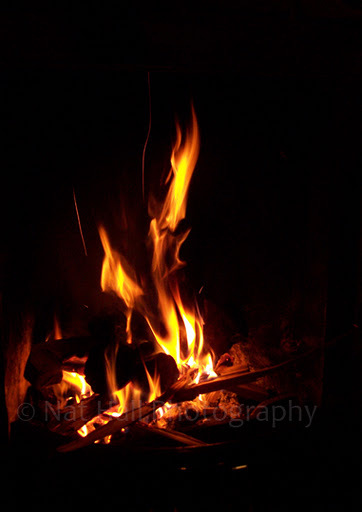 The hearth is keeping us warm. Candles bring smiles when all feels dark. And when our sky feels generous, the entire universe fills our eyes. In moonless night, we can enjoy our Northern Lights. Without a doubt, 60N is a magic place! we have been burning wood all night. follow rock doves & hooded crows. that lingers through depth of winter.